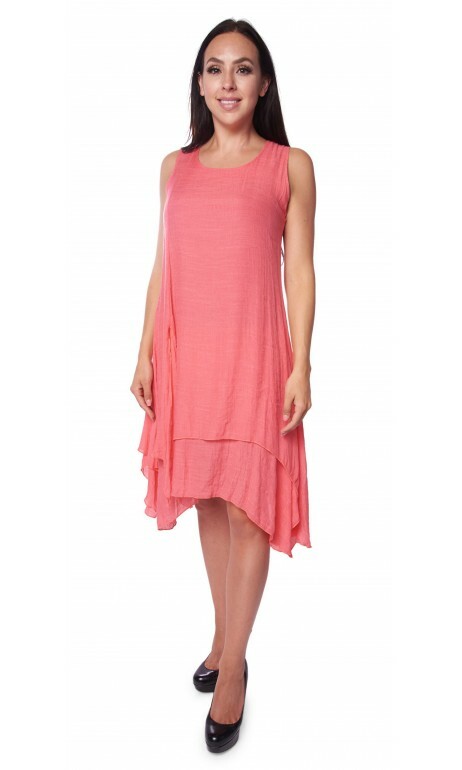 Beautiful Linen imitation dress with a touch of pink from the Spring / Summer Creation collection. Ideal for a wedding, dinner at the restaurant, travel or a cruise. Light and comfortable. Available in Small sizes at 2 X-large. 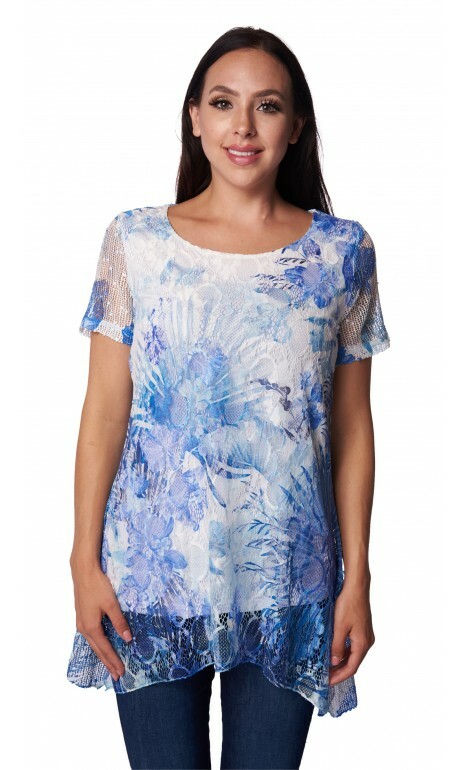 Very pretty bluish lined lace tunic from the Spring / Summer Creation collection. Brightly colored top with shades of blue. For your outings or for every day this top you will go to delight. Its line A cut is ideal to hide small curves. Available in Small sizes at 2 X-large. 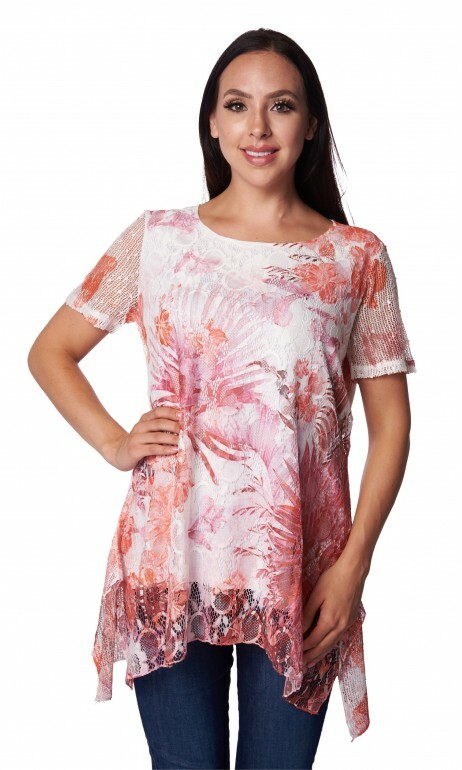 Beautiful floral lace tunic lined in orange color from the collection Spring / Summer of Creation. Short sleeves. Round neckline. Comfortable and light. Available in several sizes Small to 2 X-large. Beautiful linen imitation dress with pink-colored feather print from the Spring / Summer Creation collection. Ideal for a wedding / dinner or for a trip. Light and comfortable. Available in Small sizes at 2 X-large. Beautiful navy dress in floral voile from the Spring / Summer Creation collection. It is ideal for a wedding, dinner, trip or cruise. Very light and comfortable to wear. Available in Small sizes at 2 X-large. Beautiful little boleros in coral net from the Spring / Summer Creation Collection. Ideal to put on top of your dress or your outfit. Light and comfortable. Available in several sizes from Small to 2 X-large. Fast delivery and satisfaction guaranteed. The beautiful dress of light fabric and coral color is all the rage in shop and on the internet. This solid-colored women's clothing is perfect for any occasion. Whether for a cocktail or an invitation to a wedding this one is the ideal outfit. Available in size from Small to 2XLarge. Pretty dress from the Creation collection in fashion. imitation linen but machine washable this garment for women will be ideal for all occasions. Available in size Small up to 2XL. In pastel shades it is perfect for summer or traveling in the south. Beautiful denim imitation linen dress from the Spring / Summer Creation collection. She is super lightweight and comfortable. It's the perfect dress for this summer. It is available in several sizes Small to 2 X-large. Superb dress imitation linen but with a maintenance machine. from the Creation collection this women's clothing can be worn for any occasion. fashionable fabric with its current print. Available from Small to 2XLarge. Beautiful tunic from the new Spring / Summer Creation collection. 3/4 sleeves. Round neckline. Wrinkle resistant fabric. Available in sizes from Small to 2 X-large. Fast delivery and satisfaction guaranteed. Superb little short bolero in royal blue color from the new Spring / Summer Creation collection. Light and comfortable. Available in Small sizes at 2 X-large. fast delivery and satisfaction guaranteed. Black A line dress with sheer floral voile that thins the curves of the woman. This fashionable garment can be worn on any occasion. Available in several sizes. Slimming dress with panels flared from the waist. Colored print in shades of coral, white and black. Perfect garment for the next summer season. Available in several sizes. 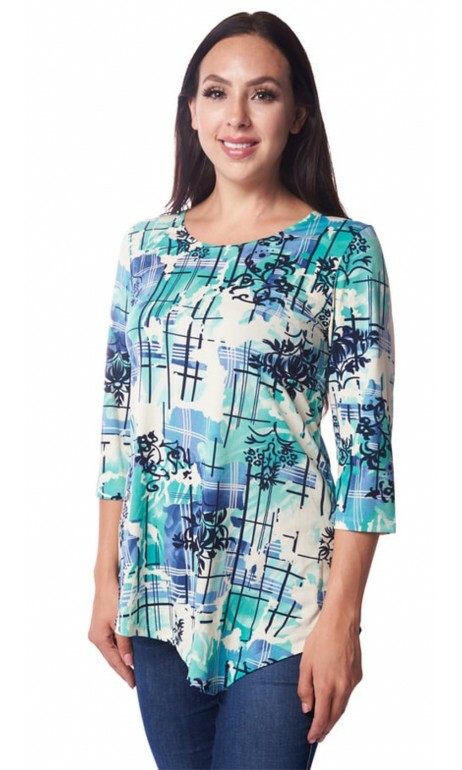 Pretty tunic from the Creation collection. This black women's clothing with 3/4 sleeves can be clasped with a small button to make a short sleeve and small glossy pastilles inlaid in the lace. Available in several sizes. Pretty dress in the shade of White with superposition of colorful veiling printed summer. This women's clothing thinens the body to hide small curves. Ideal to wear in summer or for your next trip to the south in a warm country. 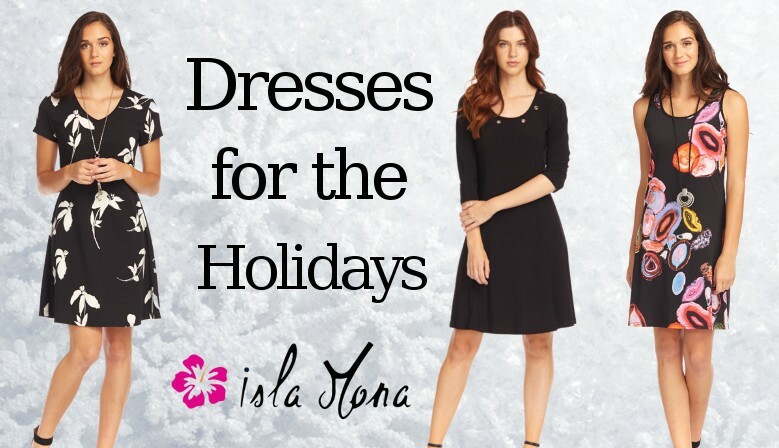 Isla Mona Boutique is a store of quality fashion clothing for misses women of all ages. 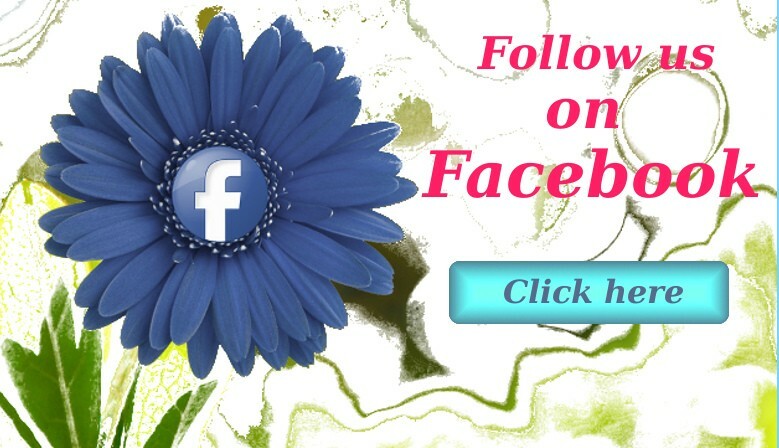 Located in Canada and we ship worldwide, we are a boutique and an online purchase commerce specializes in selling clothing made in Canada and import. 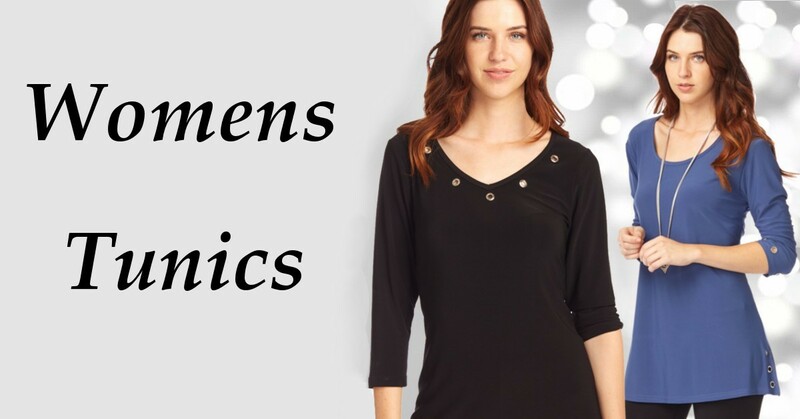 Our multiple women fashion apparels for ladies are available in X-Small up to XXXL and are of the same collection for all. 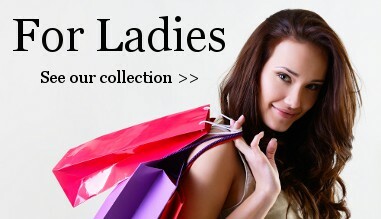 We have everything: for small and thin women and plus size clothing (large) for Women that are rounder. Several collections such as Michael tyler Collections, Modes Crystal Fashions, Modes Vin Rouge, Tango Mango dress Collection, Modes Gitane Prêt A Porter and Parsley & Sage, ect. Several clothes that lengthen the silhouette are also available. We offer a range of designer clothing ready to wear for all occasions such as travel, cruises, formal outfites, prom dress,mariage, sun dress, for work and parties as well as our latest 2019 trends. We have everything to please our customers in our multiple fabrics, pattern, writing and printed or solid color suitable for all seasons like summer sun, autumn or winter. Be it for the tunic with or without tip, which is very trendy, bolero, Pallazo and mini skirt or long rightful fashionable this spring and summer 2019, you will find the perfect dress for you. We also have dresses, jackets of all styles such as top and sweater net, T-shirt and shirts with all necklines and sleeve lengths that aligns with our accessories and jewelry (necklace and chain) rhinestone. Here you can make clothes shopping for house wives that are affordable and cheap too! Whether for work or outing with friends or simply your family, here you will find everything you need in multiple colors trend, like white, blue, black, red and green. Whether you are in Montreal, Manitoba, Vancouver, USA, Ontario, Toronto, or anywhere in the world, on the French Northeast or New Brunswick, you can find exactly what you are looking for! Come see our many garments manufacturing in Quebec are beautiful and original. Online delivery across the provinces and Canada. We ship in almost every-single-one country with best prices on the market. Call us or send us a email ! Response in 3 opening hours maximum. Visa, MasterCard, American Express, PayPal and also Bitcoin !